Indubitably, oodles of investment are made in marketing every year in chemically processed soaps in order to mislead consumers. Though typically named as natural, yet actually pertaining detergents, chemicals, and artificial fragrances are very harmful to the skin. As consumers, determining the product quality is your responsibility. Understanding about the product, its make and model are important, so that you end up buying quality soaps. However, to help you out I would like to share the differences between natural soaps and chemically processed soaps so that you make a more educated decision. Why are natural soaps considered better than store bought soaps? Let’s get started to find out the differences! Glycerin is a natural or organic substance that is used in the soaps to make the skin soft. This is the reason why the majority of the soaps, lotions, and creams contain glycerin to maintain the moisture in the skin throughout the day. The optimal amount of glycerin is to be used because the high amount will make the soap disintegrate quickly and the low amount will make the soap strong, harsh and cause dryness to the skin. Typically, natural soaps contain glycerin as compared to store soaps. Companies manufacturing handmade soaps never believe in making profits by hampering the health of the consumers, whereas, companies manufacturing unnatural soaps have a reverse ideology. The store-bought soaps do not include glycerin. In fact, glycerin is added to additional products such as lotions and creams, which make a consumer buy two products, instead of one to keep the skin moisturized thus leading to increased profits for the company. According to researchers, scented soaps contain hundreds of harmful chemicals about which you are not familiar. Such soaps are not good for the skin and may cause irritation. Whereas, the handmade soap is scented with pure essential oils that benefit the skin along with various therapeutic properties. The process of preparing the soap plays a crucial role in determining the authenticity of the soap. Usually, the correct procedure of preparing the soap is via either hot process or cold process. Either process making of homemade soap is a personal choice of a company. 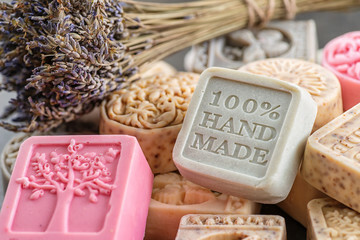 However, store bought soaps are made using numerous methods and by hundreds of hands in the process, which certainly leaves all uniqueness and authenticity of the soap. Unlike chemical soaps, using handmade soaps does no harm to the skin as it is prepared with quality products. Thus buying of organic soaps is more optimal decision to make if you want to keep your skin glowing and away from harmful substances. YOU SHOULD ALSO READ THIS: Hot Bath Vs Cold Bath, Which Is Better For You? Lastly, handmade soaps contain oil, fat, vitamins and other skin caring qualities that provide a beautiful looking skin to an individual. However, store bought soaps are made of chemicals to provide the same texture and results as that of handmade soaps. So, with all these aforementioned points, did you understand the differences between natural soaps and chemically processed soaps? Buy a handmade soap and give it a try! I assure you that you will surely find it worthwhile! Michael Bullock is a zealous blogger and passionate about writing articles on lifestyle and Natural products. He’s been writing articles and blogs since 3 years and has written for many websites. In his free time, he loves to play football, cricket. Find him on Facebook and Twitter. Why Glutamine Is Important For A Healthy Life? How You Can Become A Successful Health Blogger.